Subaru has one glaring hole in their lineup. See how they will tap Toyota Motor to fill it. Subaru Corporation is doing a lot of things right. They have a niche market of all-wheel-drive SUVs and crossovers with a “go-anywhere” attitude and they are ready to achieve their 10th straight year of record sales. They just launched a new 3-Row family hauler in the U.S. to fill the large SUV segment. But they have a big hole in their lineup they need to fill in the next few years. The only hole in the lineup is electrified cars. This is the direction the world is going and the Japanese automaker is behind most other car manufacturers. A recent study, called Driving Disruption, analyzed 16 of the largest automakers, which collectively control more than 75 percent of the global passenger vehicle market. BMW, Daimler, Toyota, Nissan, and Honda have been named the best-performing carmakers on climate issues. Subaru ranks last on the global automobile manufacturers list followed by Fiat-Chrysler, Suzuki, Hyundai, and GM as least positioned to handle the transition to building green vehicles. How will Subaru catch up with the large manufacturers around the globe? They will tap Toyota Motor to do it. Toyota owns a 16.5 percent share in Subaru Corp (the two companies co-developed the Subaru BRZ and Toyota 86 sports cars), and Toyota will assist Subaru in electrifying its lineup. Subaru has a new 2019 Crosstrek plug-in hybrid vehicle coming later this year and an all-electric coming in 2021, and they are doing it with help from Toyota, Mazda, and Denso. At the end of September 2017, Toyota and Mazda announced they would form a joint venture with parts maker Denso to design, test, and build components for a shared electric-car platform. Last year, Torque News reported Subaru would join this new partnership in order to acquire the basic technology needed to develop their new Subaru EV. Subaru is fiercely independent, but they will need Toyota, Mazda, and Denso to get there. Subaru will need this new partnership to design, test, and build components for a shared electric-car platform. They will likely develop their hybrid technology on their own, and use the electric drivetrain technologies from the partnership for their all-electric Outback, Forester and Impreza Japan models first, and then introduce them in the U.S. market possibly in 2022. Subaru just launched a new 2019 Forester eBoxer Hybrid in Japan and a Crosstrek plug-in-hybrid for the U.S. market is coming later this year. Subaru filed a patent for the name Evoltis last year that could be used for their all-electric model. It makes a lot of sense that they would team up with Toyota who has a vast knowledge and experience with electric cars. 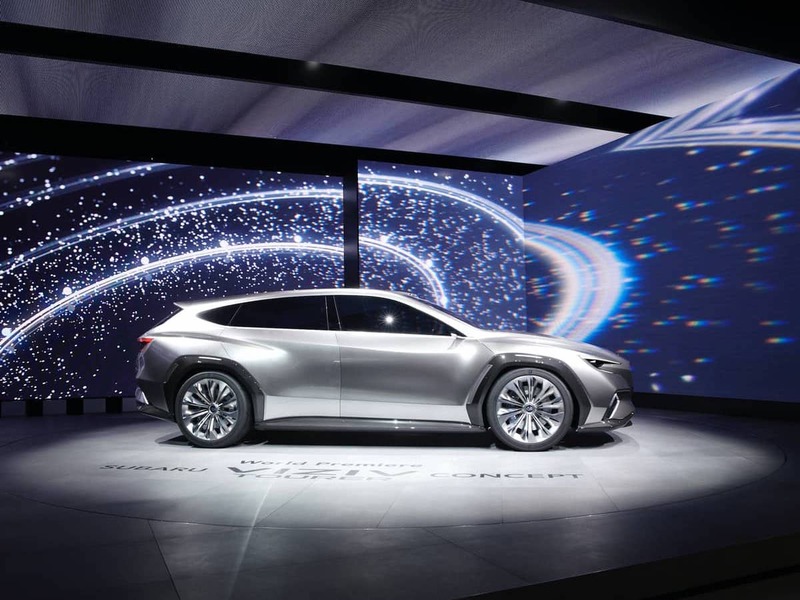 My guess is that Mazda's part in this collaboration is that they will probably share the EV tech that Toyota is providing, because Mazda is right there with Subaru in having a history of no electrical models so far. Subaru's crossovers and SUVs are the ones that can benefit the most from creating PHEV models, like Mitsubishi's new Outlander, and Honda's upcoming PHEV Pilot. But personally I would be more interested in seeing a PHEV WRX, complete with the new bolder styling from the earlier Viziv concept. I concur, but let's not hold our breath on the "bolder styling". Subaru's incremental moves (crawls) toward bolder styling have been a disappointment in terms of exterior design. I hope the new president pushes their design studio and production teams at a faster pace than previous management.